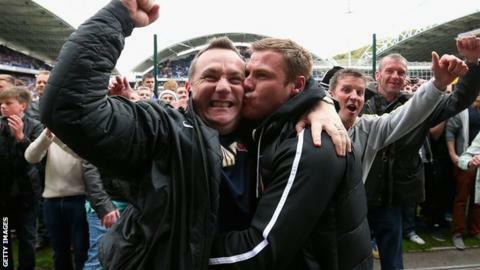 Former Barnsley manager David Flitcroft has recommended caretaker boss Micky Mellon as his successor. Flitcroft was sacked by the Championship club last Saturday after a 3-0 home defeat by Birmingham City. Mellon then guided the struggling Tykes to victory at Brighton on Tuesday. "He has an incredible and insatiable appetite for football and I couldn't think of a better person to keep the team in the league," Flitcroft told BBC Radio Sheffield. "I knew when I took Micky on that he was a manager in his own right because he was very successful with Fleetwood. He gives you experience and I hope he can do it." I was just gutted that I couldn't get the points on the board for the fans and the people of Barnsley. Flitcroft brought Mellon to the club after taking over at Oakwell 12 months ago following the departure of Keith Hill. He guided the Tykes to safety after a dramatic final-day draw at Yorkshire rivals Huddersfield, but they were unable to maintain their form from last season and had won just two of their 17 league games when he was relieved of his duties. Flitcroft thanked the club's board for how his sacking was handled. "The way it was done by (chairman) Maurice Watkins and (chief executive) Ben Mansford was very dignified and with massive respect. It was handled with a real class and professionalism and I appreciate that," he said. "I made sure all the players and staff stayed behind [on Saturday] and I spoke to them because I thought that was important. "I was just gutted that I couldn't get the points on the board for the fans and the people of Barnsley. It was very emotional." The Tykes, who remain bottom of the Championship table, travel to promotion-chasing Burnley on Saturday.